Like most of you in South Jersey, I had conflicted feelings on the day the Philadelphia Eagles signed Michael Vick in 2009. I didn’t see the logic in bringing him to the team—my team—knowing the backlash that waited around the corner. The Eagles weren’t some bottom-feeding squad in need of jolt in the marketing department, and signing Vick after 21 months in jail was not going to translate to a Super Bowl ring. And how would loyal fans, used to defending their team at the toss of a coin, be able to argue this? I once worked for the Eagles part-time as a concierge taking care of the players’ families, so I know firsthand what a classy organization they are. They didn’t need him—but what I failed to realize was that maybe Vick needed the Eagles. I think most fair-minded people believe everyone deserves a second chance, but I also realize there are some that will never forgive Vick for his crimes. They are entitled to feel that way. That cross is his to bear for the rest of his life; there’s no going back, only forward. So, as he moves forward with his life and career, I have chosen to personally move forward, too. While I in no way endorse the behavior that landed him in prison, I do endorse the behavior he exhibits today. I am rooting for him, and not just when he’s playing against the Giants. That is what makes sports so great. Without the Eagles, Vick’s story would end sadly. But because of football, he is still writing the final chapters of what could become one of the greatest ever told. This month, Philadelphia Daily News writer and Haddon Township resident Les Bowen sat down with Vick on behalf of South Jersey Magazine. It was a one-on-one interview to talk about the Birds’ highly anticipated season, but also to gain some insight into the Michael Vick few get to see away from the field: a loving father and fiancé trying to rebuild more than his reputation. You’ll also find lots of other great content in this month’s issue, from our annual Best of Home and Garden listings, to the rankings in the Public High School Report Card. 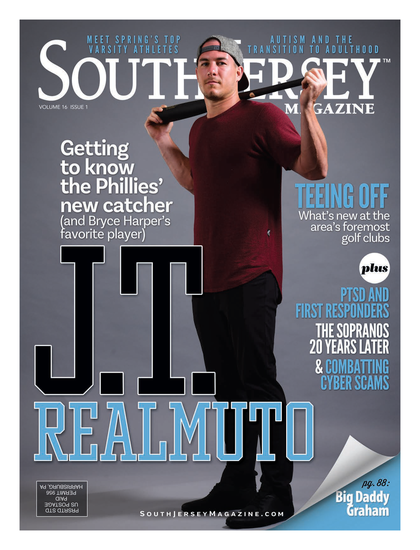 We also reflect back on a decade gone by since the Sept. 11 terrorist attacks, and feel honored to share the stories of some South Jersey residents with direct connections to that tragic day. Their strength and resolve is something to admire, and a reminder of what makes this country so great. We value our readers and advertisers, and know this is the kind of quality product they expect from us each month, which is why we are excited about not only this issue, but what’s to come. The feedback we receive is what lets us know all those late nights in the office and hard work are paying off.